Witness what’s going on in the underbelly of a small city, Japan! For some time Recession and Urban decay have become the somber reality for many small cites of Japan. They’re the ghost towns of depopulation and deindustrialization, with rows of local businesses with shutters closed for good. With the fabled economic miracle long past, it’s a common view of any cities outside metropolitan area in Japan, once the most prosperous nation in Asia. Many fled to suburbs but the city central is still populated and alive…with immigrants attracted to the fast deteriorating construction industry for wage labor. They come from other Asian countries like Thailand. Also many of them are the Japanese-Brazilians. Under the harsh circumstances they thrive for survival. The film’s star is the decaying city itself, featuring the actual locals. Rarely depicted in the Japanese cinema history, the film shows you the lives of immigrants. The ever growing communities of the Japanese-Brazilians–the descendents of the Japanese who migrated to Brazil 100 years ago–can no longer be ignored. It’s a global issue in the time of the globalization. And the inherent problems of racial, socio-economical and cultural clash are inevitable. Kofu city, Yamanashi, Japan. It’s just like any other small cities in Japan. People are sparse in downtown. All the shutters are closed on local businesses. Among the sparse population are the immigrant labors, the Japanese-Brazilians, the Thais, etc. 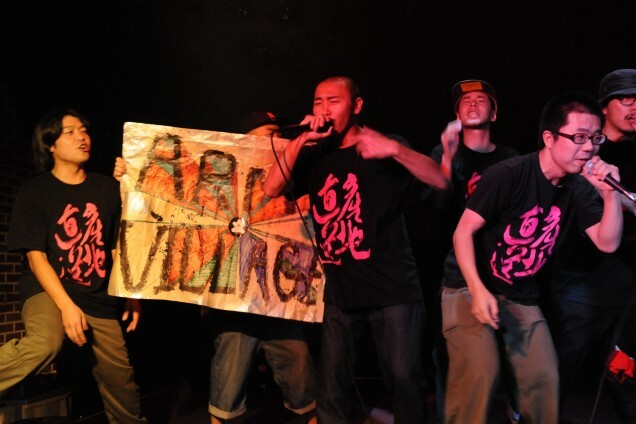 Takeru is a crew member of a local hip-hop group Army Village. His parents filed a Chapter 7 bankruptcy and are now pachinko gambling addicts. His younger brother is mentally unstable. The family is dysfunctional. Takeru registers himself to a construction labor resource agency. The agency sends him to many construction sites and he learns that there are many immigrant workers. He is befriended with Seiji and Hosaka. Construction labor is all Seiji knows in his young life. Hosaka has recently returned from Thailand. The new friends take Takeru to a local Thai-Pub where Seiji and Hosaka have a ball. Seiji flirts with Miyao, one of the companions. Takeshi feels alienated and starts to harbor hostility against the immigrants. Seiji has a wife, Keiko. She meets Yumi, one of her customers. Apparently wealthy Yumi drags Keiko into a business partnership to sell water–a trade scheme of dubious nature. Seiji has a big crush on Miyao and starts to daydream of leaving his family for her in Thailand. But Miyao can’t leave Japan. She has a family to support back in Thailand. Small subsidiary companies where the men work go out of business. Hosaka thinks there’s no future in this city. As the recession continues to worsen, the immigrants are the first to be let go. By now they’ve adapted to Japan. They live, grow up and raise family here. Do they have to go back where they come from? Japan IS their home. This is their country. But the Japanese ignore their voices. Angst is expressed but are not easily accepted or heard. The immigrants gather to dance and sing, as if to forget their hardships. Among them, Takeru finds Mahiru, his old flame. Mahiru believes that the Japanese and the Brazilians can live in harmony, and in order to validate her belief she rejects and denies Takeru’s values. Takeru meets Dennis, a Japanese-Brazilian and his all-Japanese-Brazilian hip-hop group, Smallpark. As the party progresses into the night, the Japanese and the Japanese-Brazilian hip-hop groups try to outdo one another. Born in 1972 and a native of Kofu, Yamanashi prefecture, moved to Tokyo upon graduating from high school to pursue his dream of one day becoming a musician. Throughout his days in Tokyo, he spent his time watching films and began to develop a desire to make films. He went on to earning cash working delivery jobs, and used his earnings to film. In 2003, he released his first work “Above the Cloud” (8mm), which took him five years to make. The film was awarded the highest prize in the Film School of Tokyo’s 2004 film festival, and with the award, Tomita went on to making “Off Highway 20” (16mm), later released in 2007. In his works, Tomita depicts the lives of young men living in Kofu, who, have no choice but to seek for a sense of belonging in the rural areas outside of the city. Around then, “KUZOKU -ku a tribe of film makers” was founded from his surrounding peers. The group aims to seek alternative ways to distribute film in the Japanese film industry. Their new film “SAUDADE” was produced from donations collected from KUZOKU supporters.